There are only a handful of PC companies selling Windows Home Server so far, but Microsoft announced several new hardware partners at last week's CES, plus some more software add-ins and some satisfied customers. Even more excitingly, Todd Headrick, director of the Windows Home Server Team, told TechRadar that Microsoft is working on on a minor release of the OS "some time in 2009" and then a major new version, codenamed Vail, due "some time in 2010." We knew that Vail would be making an appearance at some point, but what we didn't know what that it will be "part of the Windows 7 family." Launched two years ago at the same show and dogged by initial data problems and consumer confusion about what it does that you can't get with a cheaper NAS, Windows Home Server did get a little boost at this year's event. The main problem is that people just don't know why they need it. But customers who've worked out what Home Server is are very happy with it, says Headrick. "We just finished a survey on customer satisfaction with Home Server and the results are off the chart. 70 per cent said their expectations were exceeded with the product and that's somewhat rare – usually people say their expectations have been met." "Over 90 per cent say they would recommend it to people." The problem is getting people to consider Home Server in the first place. Having more hardware might help; Acer and Shuttle both announced their first Home Server machines at CES while HP, VIA, Niveus, Tranquil and Fujitsu Siemens have updated models. These range from the tiny barebones VIA ARTiGO to the Niveus Storage Server – Cargo Edition which has 16 hot-swappable SATA drive bays (populate them with 1.5TB drives and you could have 24TB of storage). VIA will be shipping Home Server units with space for two or eight drives (although they'll come with one drive to start with) at the end of Q1. Tranquil has a new expansion chassis that looks just like its existing server but has an eSATA port instead of Ethernet so you can add another five drive bays. Shuttle will have two and three-drive models, though initially only for the US market. HP's new MediaSmart Server adds an eSATA port and Time Machine backup for Macs (which will also be available as an update for existing models). Several Home Server models use VIA's C-7 low-power processors, which are well suited to a server that's on all the time and not usually running programs that need a lot of performance. Now Intel is getting into this niche; the Acer Aspire EasyStore Home Server has the Atom 230 processor more often found in netbooks and up to four hot-swappable SATA drives. Tranquil also uses an Atom chip. 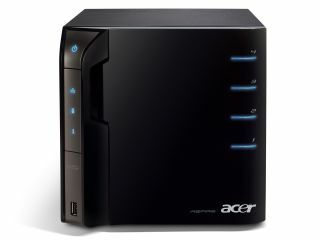 Both Acer and HP are include an add-in that will copy files from an external hard drive onto the Home Server and then delete the files and add the drive to the general storage pool. The EasyStore also comes with the Twonky media streaming server add-in that HP and Fujitsu Simens have been including; this has been so popular that Twonky is planning to create a version it can sell to all Home Server users. There are other partners still to come, says Headrick. Not all of them will say Windows Home Server on the box; Tranquil calls one model a streaming music server without naming the OS it runs, while another OEM is planning to develop a solution for home businesses. They make up 25 per cent of Home Server buyers - around a third of Windows Small Business Server sales have traditionally been to home users. So far the only feature announced for Vail is support for Windows 7 Homegroups. Although you can back up a Windows 7 PC to a Home Server like any other PC and you can access shared files on a Home Server from Windows 7, today the Home server can't be part of a Homegroup. That means files won't show up in libraries. As Windows general manager Mike Ybarra puts it: "we've had a great discussion over the last three months and the Homegroup team is very focussed on making sure we correct this problem". Headrick can't say whether every Home Server will be able to be upgraded. "It's really up to the hardware partners to decide how to handle the upgrade path, because they're the ones doing the support of the box." Enthusiasts who've built their own machines will be able to upgrade if the system is powerful enough: "Vail will be 64-bit only: we said that before we ever shipped the initial release of Home Server. If you want to repurpose an old PC, go ahead, but don't expect us to support it until the end of time." He's going to be buying some new hardware himself. "I'm going to take the ARTiGO and sneak it into my dad's house and not tell him. Every time I visit I do six hours of work on his PC. Now I'm going to go into the server and do it while he sleeps."